Maybe N. Bergman or L. Fogelman can explain why there are so many distilled spirits plants in New York, all of a sudden. Here are three, and all are distilling vodka from apples (rather than the much more common and less expensive distillation from grain). 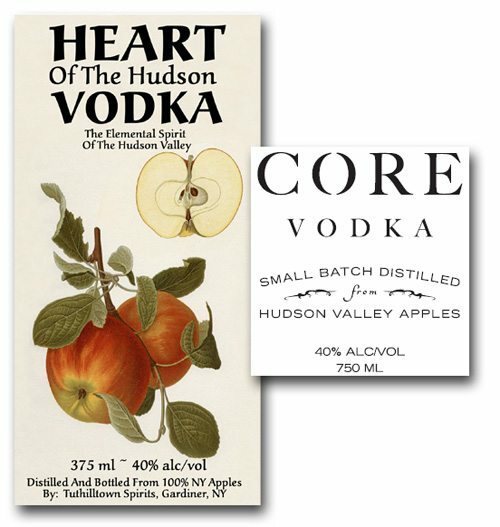 Tuthilltown Spirits makes Heart of the Hudson Vodka (above). It is distilled from 100% New York apples. Eighty miles up the Hudson River, Harvest Spirits makes Core Vodka. They purport to distill only from Hudson Valley apples, in small batches. Third, there is Beak & Skiff Vodka, also distilled from apples, over near Syracuse. Larrie Laird (the dean of distilling apples in the US) once explained that it is immensely expensive to produce high-proof spirits from apples or any other fruit. It can take well over 25 pounds of apples to make one bottle.